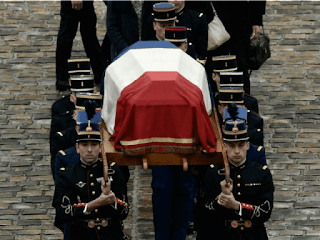 The funeral of slain hero officer of Carcassonne attack. A significant majority of French now support banning the radical Salafist sect of Islam, and the government reinstating the national state of emergency, as the nation reels from another deadly radical Islamic terror attack in March. Perhaps most significantly, 88 per cent of French said they supported banning the rapidly expanding, radical Salafist sect of Islam, even though over half of respondents said they acknowledged that implementing the ban in France would be difficult, if not impossible. Breitbart London has previously reported on the nature of Salafism, which contains many radical preachers who see violence as legitimate in pursuance of its aims and which provides the intellectual basis for the Islamic State. A regional director of Germany’s constitutional police said of the faith in 2017 that “every jihadist terrorist we’ve seen in Europe in recent years came from the Salafist scene”. In addition to banning the radical interpretation of Islam, a majority of French surveyed also supported deporting terrorists, too. Le Figaro reports 83 per cent supported deporting foreigners on French soil who have so-called ‘S’ (security) case files on them held by the security services — the French term demonstrating that an individual is considered a potentially dangerous radical by the French state.